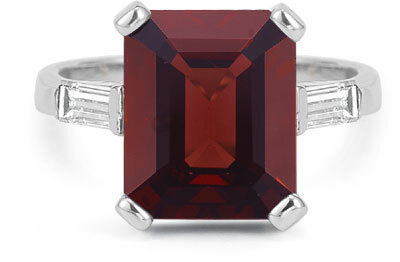 Daring and alluring, this white gold and garnet ring is a captivating showpiece. Not to be taken lightly, the 5 Carat Emerald-Cut Garnet and Baguette Diamond Ring commands a captivating audience, while its rich color conveys a sophisticated message of love and desire. Once the light hits it, the garnet quite simply owns the room.